On the evening of 22 May 1844, a significant moment in human history occurred. In the city of Shiraz, Iran, the Báb declared the beginning of a new religious cycle for the world. At midnight, on that same evening, a baby was born in Tehran. Bahá’u’lláh, in honour of His own father, named His newborn son, ‘Abbás. But, in time, ‘Abbás chose to call Himself ‘Abdu’l-Bahá, the “Servant of Bahá”, and, through His life of service to humanity, became known as the living embodiment and exemplar of Bahá’u’lláh’s teachings. ‘Abdu’l-Bahá enjoyed a privileged childhood until fierce persecutions broke out against the Báb’s followers—of whom Bahá’u’lláh was the most prominent. Bahá’u’lláh’s incarceration for being a Bábí marked a turning point for His family. Seeing Bahá’u’lláh in prison—His hair and beard unkempt, His neck swollen from the heavy steel collar, His body bent by chains—made an indelible impression on the mind of His eight year-old son. In December 1852, Bahá’u’lláh was released from prison after four months. Almost immediately, He was banished from Iran with His family. They were never to see their native land again. On the trek to Baghdad, ‘Abdu’l-Bahá suffered frostbite and grieved over the separation from his baby brother, Mihdí, who was not well enough to make the gruelling journey. Soon after their arrival in Baghdad, another painful separation followed when Bahá’u’lláh retreated into the mountains of Kurdistan for a period of two years. With His beloved Father away, ‘Abdu’l-Bahá occupied His time reading and meditating upon the Writings of the Báb. ‘Abdu’l-Bahá as a young man, photographed during His Father’s exile to Adrianople, 1863-1868. When Bahá’u’lláh finally returned, the 12 year-old boy was overwhelmed with joy. Despite His tender age, ‘Abdu’l-Bahá had already intuitively recognized the station of His Father. In the years that immediately followed, ‘Abdu’l-Bahá became Bahá’u’lláh’s representative and His secretary. He shielded His Father from unnecessary intrusions and the malice of those who wished Him ill and became revered in circles beyond His Father’s followers, conversing with the wise and learned on themes and topics that occupied their minds. One commentary He wrote while still in His teens demonstrated His already profound knowledge and understanding, and a striking mastery of language. Throughout their exiles, ‘Abdu’l-Bahá also assumed the burden of various negotiations with civil authorities. During Bahá’u’lláh’s final banishment to ‘Akká, ‘Abdu’l-Bahá continued to protect His Father, took care of His followers, tended to the sick and the poor in the city, and held His ground on matters of justice with callous jailers, brutal guards and hostile officials. ‘Abdu’l-Bahá’s generosity of spirit, selfless service and adherence to principle endeared Him to those who came to know Him and, in time, won over even the most hard-hearted of enemies. In His Most Holy Book, Bahá’u’lláh established a covenant with His followers, enjoining them to turn, after His passing, to ‘Abdu’l-Bahá, Who He describes as “Him Whom God hath purposed, Who hath branched from this Ancient Root.” ‘Abdu’l-Bahá’s authority as the “Centre of the Covenant” was also established in other texts, including Bahá’u’lláh’s Will and Testament. From the time of Bahá’u’lláh’s passing, ‘Abdu’l-Bahá oversaw the spread of His Father’s Faith to new territories, including North America and Europe. He received a steady flow of pilgrims from both the East and the West, carried out an extensive correspondence with Bahá’ís and inquirers in all parts of the world, and lived an exemplary life of service to the people of ‘Akká. Envious of ‘Abdu’l-Bahá’s influence, His younger half-brother—Mirza Muhammad ‘Alí—tried to undermine and usurp ‘Abdu’l-Bahá’s authority. Efforts to stir up further suspicion against ‘Abdu’l-Bahá in the minds of the already hostile authorities resulted in restrictions that had gradually been relaxed over the years being re-imposed. Although these attacks caused great pain to Him and His loyal followers, they failed to cause lasting damage to the unity of the community or the spread of the Bahá’í Faith. 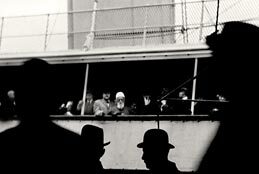 ‘Abdu’l-Bahá glimpsed on board the “S.S. Celtic” as He sailed from New York City bound for Liverpool, England, 5 December 1912. As early as 1907, ‘Abdu’l-Bahá had begun moving His family to Haifa, across the bay from ‘Akká, where He had built a house at the foot of Mount Carmel. In 1908, turmoil in the Ottoman capital culminated in the Young Turk Revolution. The Sultan released all of the empire’s religious and political prisoners and, after decades of imprisonment and exile, ‘Abdu’l-Bahá was free. Despite tremendous challenges, work on a tomb for the Báb had proceeded, midway up the mountain, in a spot designated by Bahá’u’lláh Himself. In March 1909, ‘Abdu’l-Bahá was able to place the Báb’s remains in the Shrine He had constructed. The following year, ‘Abdu’l-Bahá departed Haifa for Egypt, where He stayed one year, spending His days meeting diplomats, intellectuals, religious leaders and journalists. In the late summer of 1911, He sailed for Europe, stopping at the French resort of Thonon-les-Bains before traveling to London. On 10 September 1911, from the pulpit of the City Temple church in London, ‘Abdu’l-Bahá gave a public address for the first time in His life. His subsequent month-long stay in England was filled with ceaseless activity, promoting Bahá’u’lláh’s teachings and their application to many contemporary issues and problems, through public talks, meetings with the press and interviews with individuals. The days in London, and then Paris, set a pattern that He would follow throughout all of His travels. In the spring of 1912, ‘Abdu’l-Bahá journeyed to the United States and Canada for nine months. He travelled from coast to coast, addressing every kind of audience, meeting people of all ranks and stations. At the end of the year, He returned to Britain and early in 1913, to France, from where He proceeded to Germany, Hungary and Austria, returning in May to Egypt, and on 5 December 1913, to the Holy Land. 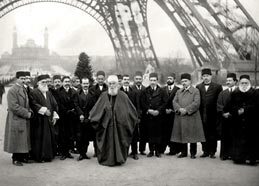 ‘Abdu’l-Bahá and His entourage beneath the Eiffel Tower in Paris, in 1912. ‘Abdu’l-Bahá’s travels in the West contributed significantly to the spread of Bahá’u’lláh’s teachings and the firm establishment of Bahá’í communities in Europe and North America. On both continents, He received a highly appreciative welcome from distinguished audiences concerned about the condition of modern society, devoted to such concerns as peace, women’s rights, racial equality, social reform and moral development. During His travels, ‘Abdu’l-Bahá’s message was the announcement that the long-promised age for the unification of humanity had come. He frequently spoke of the need to create the social conditions and the international political instruments necessary to establish peace. Less than two years later, His premonitions of a world-encircling conflict became a reality. When the First World War broke out, ‘Abdu’l-Bahá’s communication with the Bahá’ís abroad was almost completely cut off. He spent the war years ministering to the material and spiritual needs of the people around Him, personally organizing extensive agricultural operations, and averting a famine for the poor of all religions in Haifa and ‘Akká. His service to the people of Palestine was honoured with a knighthood from the British Empire in April 1920. During the war years, ‘Abdu’l-Bahá produced one of the most important works of His ministry: fourteen letters, known collectively as the Tablets of the Divine Plan, addressed to the Bahá’ís of North America outlining the spiritual qualities and attitudes as well as the practical actions needed to spread the Bahá’í teachings throughout the world. In His old age, ‘Abdu’l-Bahá remained remarkably vigorous. He was a loving father not only to the community of Bahá’ís in Haifa, but to a burgeoning international movement. His correspondence guided global efforts to establish an organizational framework for the community. His interaction with a stream of pilgrims to the Holy Land provided another instrument for instructing and encouraging believers from around the world. 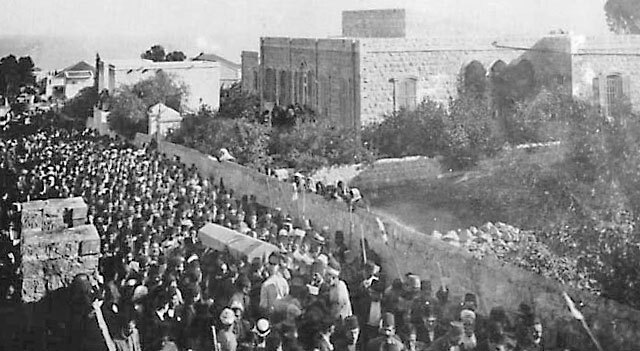 The funeral of ‘Abdu’l-Bahá in Haifa, November 1921. Ten thousand mourners of numerous religious backgrounds attended His funeral. ‘Abdu’l-Bahá’s mortal remains were laid to rest in one of the chambers of the Shrine of the Báb on Mount Carmel.